If there’s something really important to me, I prepare. I rest. I find the strength from somewhere to push through. But I pay for it. I have a hard time saying no, but I’ve been better at picking and prioritizing what’s important. If it means that much to me, I sacrifice my health. Is that smart? No. But I want to live, not just survive. It’s worth it to me. I realize that not everyone can travel, whether it’s for a conference or even a family vacation. I won’t pretend that my health has been great this whole time. I’ve had my struggles, sometimes spending more time in my hotel room than in seminars or skipping out early to take a nap. I have issues with let-down migraine attacks. I run on adrenaline and when it’s over, I simply crash and fall apart. Is that smart? No. But I want to live, not just survive. ← Migraine Takes. But It Also Gives Sometimes. 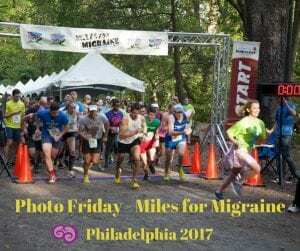 My dad gets ocular or retinal migraine attacks. He gets a visual aura that lasts 15-20 minutes and then he doesn’t get the head pain. Oddly, his attacks started after I became chronic. Thanks so much for your kind words. We all have a choice whether to accept our lot in life or to be miserable. I’ve had my dark days but overall I keep a positive attitude. Wallowing doesn’t change anything. Glad you’re active in AHMA, such a grwat organization! I wish we didn’t have to go through this, but at least we’rw in good company! In 2014 I found Teri’s HealthCentral Facebook page, which lead me to AHMA. I’ve had migraine since I was 16, but didn’t go chronic until 2001. So for 14yrs I navigated through chronic migraine, with no support at all. Teri’s group and AHMA changed all of that, I learned so much and made some awesome friendships. It also opened up a new purpose in life for me, supporting, encouraging, inspiring and advocating, for those in the migraine community. I started with Twitter in Sept. 2015 and now a blog, my horizons are expanding, and that gives me a new lease on life with chronic migraine.